A significant proportion of patients affected by renal cell carcinoma (RCC) shows a suspicious lymph node involvement (LNI) at preoperative imaging. We sought to evaluate the effect of lymphadenopathies (cN1) on survival in surgical RCC patients with no evidence of LNI at final pathology (pN0). 719 patients underwent either radical or partial nephrectomy and lymph node dissection at a single tertiary care referral centre between 1987 and 2015. All patients had pathologically no LNI (pN0). Outcomes of the study were cancer-specific mortality (CSM) and other-cause mortality. Multivariable competing-risks regression models assessed the impact of inflammatory lymphadenopathies (cN1pN0) on mortality rates, after adjustment for clinical and pathological confounders. 114 (16%) and 605 (84%) patients (16%) were cN1pN0 and cN0pN0, respectively. 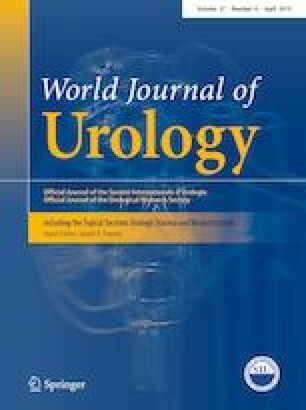 cN1pN0 patients were more frequently diagnosed with larger tumours (8.4 vs. 6.5 cm), higher pathological tumour stage (pT3–4 in 71 vs. 36%), higher Fuhrman grade (G3–G4 in 64 vs. 31%), more frequently with necrosis (75 vs. 44%), and distant metastases (33 vs. 10%) (all p < 0.0001). At univariable analysis, inflammatory lymphadenopathies resulted associated with worse CSM (HR 2.45; p < 0.0001). However, at multivariable analysis, inflammatory lymphadenopathies were not an independent predictor of CSM (HR 0.81; p = 0.4). The presence of metastases at diagnosis was the most important factor affecting CSM (HR 6.54; p < 0.0001). This study is limited by its retrospective nature. In RCC patients, inflammatory lymphadenopathies (cN1pN0) are associated with unfavourable clinical and pathological characteristics. However, the presence of inflammatory lymphadenopathies does not affect RCC-specific mortality. Fabio Muttin and Angela Pecoraro have equally contributed. The online version of this article ( https://doi.org/10.1007/s00345-018-2412-6) contains supplementary material, which is available to authorized users. All procedures performed in studies involving human participants were in accordance with the ethical standards of the institutional research committee and with the 1964 Helsinki declaration and its later amendments or comparable ethical standards. For this type of study, formal consent is not required. This article does not contain any studies with animals performed by any of the authors.